Many find their way to St Mary’s Church at Pilleth for quietness and prayer. Here is a place in which to seek forgiveness and to lay down the burdens of the past, looking to the future with hope and confidence. The earliest reference to Pilleth is in the Doomsday Book, where it is noted as Pilelei. 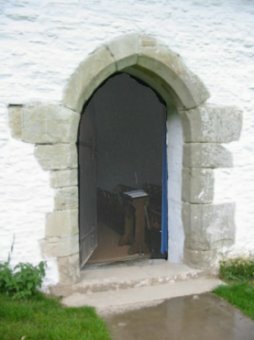 The church was a place of pilgrimage in medieval times and the Holy Well on the north side was reputed to have healing properties, for the eyes in particular. It is not known exactly how long Pilleth has been a place of Christian worship, but the current building is thought to date predominantly from the 14th century although Haslam dated the tower earlier. Its single bell is said to date from 1450. The Church was burned in the Battle of Pilleth, 1402, when the Welsh forces of Owain Glyndwr, ‘Prince of Wales’, defeated the English forces of Edmund Mortimer, Lord of the March. In the 19th century, a burial ground of many killed in the battle was discovered on the hillside above and four Wellingtonias were planted to mark the site. Others are buried in the churchyard. In the 18th century Dame Anna Child, one of the Price Family of Pilleth Court, endowed the school at Whitton for the education of children from the nearby parishes. It is still flourishing. At the end of the 19th century, the restored church caught fire and was gutted due to a newly installed central heating system. In 1911, the now roofless church was restored by the eminent architect Sir William Tapper. He was also responsible for the design and construction of the flight of stone steps leading up to the church from the car park. This was made possible through the generosity of Edward Whitehead of Nant-y-Groes. The temporary roof, installed until the Parish found the means for a more permanent one, lasted until it was replaced in the recent restoration of 2002–04. In the first half of the 20th century, the church was cared for by the then landowner, Sir Robert Green-Price and his wife, Lucille, who, like many, were captivated by the setting and simplicity of this little church. In 1956, Colonel and Mrs Hood came to farm at Pilleth Court. Their son, Peter and his wife, Heather, followed them. The Hood Family have cherished the church and it is to them that the church owes its maintenance. Winstrol – What stacks well with the anabolic steroid? Why Are BCAAs So Highly Regarded? Is a Dianabol Only Cycle Worth It? How Effective Are Fat Burners?